For the 2010 Week of Prayer for Christian Unity the Churches of Scotland chose the theme of "You Are Witnesses of These Things" (Luke 24:48) In describing the ecumenical endeavor in Scotland the planning committee used the image of a tartan and its many aspects to describe the dialogues that have taken place or are currently taking place in Scotland. Like the weave of a tartan there are a variety of witnesses in the Church to the Prayer for Christian Unity. 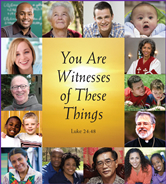 In this year's poster you will discover the faces of a variety of "witnesses to these things" as they reveal the universal nature of church's prayer for Christian unity. The golden toned panel at the center of the poster is representational of the Risen Savior and his call for all to be "witnesses of these things" in the quest for Christian Unity. The conceptual design of the artwork was formulated by Fr. Thomas Orians, SA and the completion of the artwork is the work of RKG FundRaising Services, Cold Spring, New York.